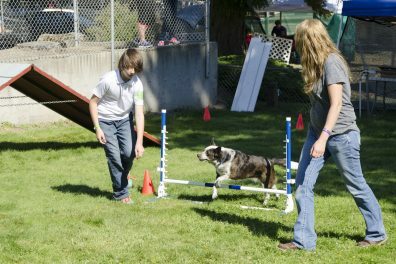 4-H Members must be enrolled in “Dog” or “Service Dog” projects by June 1st. Dog projects are open to all age divisions including Cloverbuds. Project animals must be under the management and care of the 4-H member 60 days prior to fair. Any breed (purebred or mixed) is allowed. Dogs must be safely handled by the 4-H member. 4-H leaders reserve the right to disqualify any dog that is observed to be unfit for 4-H participation. Dogs MUST come with verification of the following vaccines: Distemper, Infectious Hepatitis, Para-influenza, Parvo (DHPP), Kennel Cough, and Rabies. Recommended optional vaccinations: Leptospirosis, Corona. Rabies vaccination certificate must come from veterinarian and include: Date of most recent vaccination, dog’s name or ID and age, brand or type of vaccine, veterinarians’ signature and license (no stamped signature).